International Journal of Research in Health Sciences,2015,3,4,460-467. 1-Associate Professor, 2-Assistant Professor, 3-Post graduate, Department of Paediatrics, Niloufer Hospital, Osmania Medical College, Hyderabad, INDIA. Background: Adolescence is a transitional stage of physical and psychological human development that generally occurs during the period from puberty to legal adulthood (age of majority). The period of adolescence is most closely associated with the teenage years though its physical, psychological and cultural expressions may begin earlier and end later. Hence Adolescents should receive explicit attention with services that are sensitive to their increased vulnerabilities and designed to meet their needs. Objectives: To study the prevalence of risk behaviors in adolescents these included substance abuse, high risk sexual behavior, STIs and HIV/ AIDS, violence and juvenile delinquency and mental health and to compare these factors among the adolescents of Govt. and Private schools and Junior colleges of Hyderabad. Methods: It was a cross sectional study , conducted among 250 Students ( 150 boys and 100 girls) in the age group of 10-19years attending 5 schools and 2 colleges at Hyderabad in the period of December 2013 to July 2014 .Schools and colleges were selected by draw method. Students to be included were determined by taking every 5th, 10th, 15th, 20th, On an Average, 25 students were taken in each age group. Participants were given pre-tested, pre-designed questionnaire, “The Child Behavior Checklist”. Participants signed written informed consent and then completed questionnaire. Classroom teachers administered the Adolescent Exploratory and Risk Behavior Rating Scale (AERRS) to students. Randomly selected students were also asked to answer five open-ended questions about the risk behavior. The Adolescent Exploratory and Risk Behavior Rating Scale (AERRS) was developed. 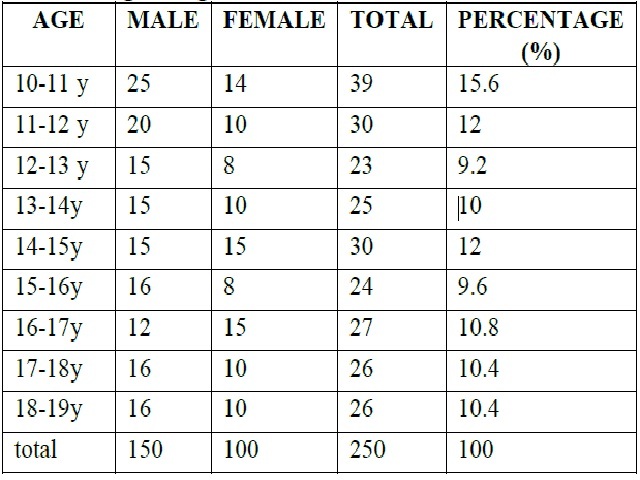 Demographics of participant groups were described in terms of gender, age and type of school attended. Demographic data were described for the total sample, the samples used for each of the five analytes of risk behavior. The number of participants (n = 250) was randomly selected from each dataset for a set of high risk behavior analyses. Results: In present study substance abuse in government and private schools is 28% and government and private colleges is also 28%, i.e. both schools and college group of adolescents showed same prevalence of substance abuse. In our study as tobacco, alcohol usage is mostly seen. In the Present study high risk sexual behavior at government and private schools have 16% and government and private colleges is also 16% , shows that both school and college adolescents have same behaviors. In present study mental health is disturbed has data in schools is 16% where as in colleges it is 20% showing that college going adolescents are more suffering from depression ,anxiety etc. Gender differences between adolescents who attempt suicide and those who complete suicide were similar to that of the international literature. Our study has slightly higher percentage when compared to other studies. Conclusions: Even though the risk behaviors on the whole is less in Hyderabad adolescent population as compared to studies of U.S and other parts of world , we need to address these critical issues, to promote the health of adolescents in this Region. Adolescence is considered to be a very critical transitional stage of life with acute crises in which future is at stake. Future research should emphasize the designing and testing of interventions to alleviate this burden.